Top Flat has some of the best views in the house, south facing, over looking Loch Bourne towards the Cairngorms and Glenfeshie. This apartment is on the top floor of Alvie House and has 5 twin bedrooms, drawing room, dining room, fully equipped kitchen, including a dishwasher, 2 bathrooms & an additional WC. All linen is provided (except towels), laundry facilities are available in the basement of Alvie House. The apartment has a TV as well as dvd & cd players. Wifi signal is available from Alvie House. Just the most lovely place for family and friends to spend time celebrating. No frills, no showers, just big lovely baths. Everyone was too warm in bed even with windows wide open. Shame tennis courts almost unplayable, although there was some racquet action by the die hard players. We had an ace time and will visit again. We have been staying at Alvie for over 30 years, It is excellent value for money and meets our needs exactly. An ideal location for exploring the Cairngorms in winter, Offers spacious and comfortable accommodation for large mountaineering groups and their associated equipment. Had a lovely stay at alvie. It's a big quirky, old place full of character. It was very warm and clean , but much of the furniture has seen better days especially the sofas and beds. Also have to say that although the linen was fine, the actual duvets pillows and mattresses were old and done and not particularly comfortable. The kitchen is very small and difficult to cater for ten people in, we struggled with seven people. Also the two old bathrooms were okay but not particularly convenient esp the lack of a shower. Criticisms aside it is a lovely old flat, if you don't mind shabby . In my opinion it's not really up to providing for ten people apart from having ten single beds, therefore it's a bit expensive. The north wing downstairs looked much more appealing and will try that one next time. Alvie House top flat is situated in a beautiful location and has a proper old country house feel to it with old fashioned but comfortable furniture and fittings. I organised a get together for family members. Some stayed in the top flat and they found it very comfortable and well kitted out. The rooms were a good size-mainly single beds but everyone was very comfortable. The flat has a lovely large dining room for us all to eat together. A great holiday with lots of activities on the estate and near by. We were an extended family group staying in the top flat as well as the bottom one. We had a great week. The top flat is well appointed, clean and spacious. Despite being a noisy group with lots of young children we were made to feel welcome. We enjoyed exploring the grounds of the Estate and the wider area. Excellent venue to a stay in the Cairngorms with a group of people. In our experience second to none. The house is stunning with great views of the mountains and good accessibility to the area being just off the A9. Comfortable, spacious, old-fashioned (in a very nice way). Kitchen isn't great, but easy to work round that given the excellent dining room. No showers, but massive claw-footed baths and plenty of hot water. Very chilled place. We were really pleasantly surprised by the amazing amount of space and lovely atmosphere of the Top Flat. The website and description don't do it justice! It was a great space for a group of families, and also dog friendly. Everybody we met who works/lives on the estate was really friendly and we hope to come back again. We have booked the Top Flat along with the Nirth Wing for many years to accommodate our merry band of old friends. The last thing we do before we leave is to book for the following year. The large dining room and the open fire in the very comfortable living room are two of the brilliant features of the flat. The top flat at Alvie House was the perfect place for my family. I delighted waking up each morning to the view of the pond and its beautiful setting. On the other side of the flat those bedroom and the kitchen got to look up onto the heather laden hills on this region. The flat was nicely furnished and comfortable. The walking in the estate is amazing. My children went riding at the Alvie stables and enjoy that several times over the week stay. We also did the zip lines which we highly recommend for the young and older set. The question I always ask prior guests of a rental I am considering is would you go back. Without question, I would rent the top flat at Alvie again in a heart beat. It was delight to stay there and I am looking forward to returning here on my next trip to Scotland. The only thing I would do differently next time is I would preorder my Tesco groceries for delivery for the day of my arrival. We were in Aviemore for the Stopover Festival 2015. The Alvie House Top Flat was the best value for money, when most places had increased their prices the top flat was very reasonable. The flat easily accommodated our party of 7. Note that there are no showers, but there are two baths that fill quickly with hot water. The kitchen was stocked with all the pots, pans and crockery we needed. The location is well known to the local taxi company and is handy for getting to and from Aviemore. Its also ideally located for a variety of outdoor activities. I read several reviews before I booked and took on board the one about getting your shopping delivered by Tesco. This turned out to be really useful. It arrived on time and the driver commented that most of the stuff we had ordered would not have been available at the local Tesco in Aviemore, and that he had come from Inverness. Other people have commented on the lack of showers. I normally shower, however having a good soak in a bath after a long walk was bliss! We had 8 people, there were 2 baths, plenty of hot water and they filled really quickly, so we had no problems. Certainly enjoyed all our walks and even some skiing! A great Easter break helped by the good weather (18C in Dalwhinnie!). visit, some the 3rd, some their 2nd and some their 1st. or less as the like (they need watching around the lochan) and plenty to do in the area. The zip wire for one is a must. On top of this the house is clean, comfortable and well appointed without being in anyway overwhelming. A proper home from home. So far as this family is concerned, it is highly recommended. We are already looking to return next year. I would recommend Alvie House to anyone wanting to stay in the Highlands. We've had another brilliant holiday in the Cairngorms and the Top Flat is a firm favourite with all of us who stay there. The staff are very approachable and try hard to make sure we have everything we need. Alvie is such a brilliant location for a Cairngorm holiday and I'm sure that we will continue to stay here for many years to come. Thank you for your comments which we cannot agree with. We honestly feel that you chose the wrong type of accommodation for your group. Your group appeared to be inebriated & noisy for most of the weekend that you stayed with us. You used inappropriate language & disturbed other residents in the House & we are sure that you would have been more suited to hotel accommodation in a different location rather than the tranquil setting of Alvie Estate. You will note that other reviews for the same property have a completely different view to yours. Views of hills and loch. Plenty of space. Great base for a holiday. There is so much to do within walking distance on the estate including the zip wire which is a great thrill for almost any age. Will definitely go again. Large spacious bright clean! Everything was organised so well they provide everything you need. Fantastic location to explore Cairngorms then a log fire and board games in the evenings. Only single downside absolutely no wifi at all which made planning trips very hard if you need the internet for anything. Five days no internet is hard but I think you can cope- we managed with teenagers who usually live on Facebook! No one switched on their laptops to check email etc which was a plus in a way too. Do online tesco delivery before you get here and that's food sorted ! A shower even hand held would be great but bathrooms were clean and big. All in all top marks from a family of grand parents aunts uncles and kids! This is the 11th Year at Alvie. Fantastic base to explore the beautiful countryside. The men played golf at Kinussie and had a great time. The ladies went for a walk enjoying Loch Eilean and we also went for a spa session at the McDonald hotel on the Sunday. This was a 3 day break but I would thoroughly recommend this for families and for week long stays. The staff are helpful and we plan to return next year. Review of our decade of holidays at Alvie. We have had a week in the Top Flat each February for the last ten years and it is my favourite holiday if the year. 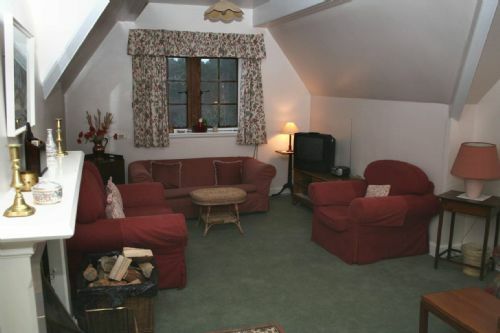 It is comfortable, rather than 'posh' but is an ideal venue for a family gathering or for a holiday with good friends. The staff are very helpful and friendly. The location is perfect for skiing, cycling, walking or whisky tasting! Whatever the weather we always gave a great time.